As Robert Nesta Marley embodied all the trappings designated to others appropriately so named before his time, why debate whether he should be a part of the echelon reserved for greats of his ilk? Why is he not a national hero? Castro is to Cuba's Revolution as Bob Marley was to the Reggae revolution. The uncanny relevance and blatant honesty of his social commentary was transformed into music when wedded to the commanding rhythms, most led by trademark guitar solos. A combination to be reckoned with, Marley’s music etched on the international stage an endemic spot, not exclusively for Jamaica’s music, but for Jamaica. With the music, Bob Marley and The Wailers, comrades of the great reggae enlightenment exported nuances of the island’s culture celebrated by music lovers world over as part of a compelling attraction to the Jamaican experience. 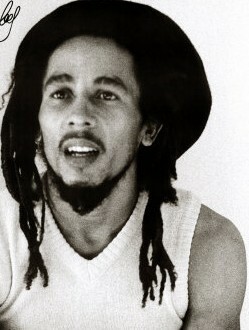 Marley and his disciples, in the face of symbolic religious intolerance and political instability in the 1970s and early 1980s, continued to wear the tag of pioneers of the Reggae revolution and main perpetrators of the rise and dissemination of the Rastafarian religion, culture, and teachings. At a time I think embarrassed Jamaica’s history, followers of the Rastafarian ethos were cajoled to shed their beliefs, and defiant advocates of the faith were lasoed by police intimidation. In extreme circumstances, Rastafarians were stocked in government – supported law enforcement menagerie where their locks, the ultimate manifestation of their detachment from the status quo, were snipped from their roots. Ultimately, boasting dreadlocks was labeled taboo and Rastafarians were essentially declared persona non grata in the society of the gentry, the refined, and believe it or not the educated. Eventually, Marley and the enclave of followers of the faith which holds Ethiopian emperor, His Imperial Majesty, Haile Selassie I as deity, were identified among the have nots on Jamaica’s economic landscape. As they were social pariahs, it was difficult to attain jobs and accumulate financial wealth and respect. It comes as no surprise they consulted the power of music for deliverance from an institutionalized system of socio-religious oppression. What followed was an exodus of these, Jah People, toward the Reggae revolution, at the time, the sole medium of retaliation against their persecution. And even for a while, they felt no pain when they were hit with the music and of course, the Kaya aka: marijuana, ganja, spliff, joint, weed, herb, pot. In the wake of their struggles, Marley and other Rastafarians coined the term babylon, initially a badge attached to the police, in their “uniform of brutality,” who were instructed to harrass and bullyrag Bubbo Dreads. The term conjures up a portrait of all institutions which advocated oppression and upheld the “isms” and “schisms” that formed the backbone of this historic intolerance. The term evolved in meanings over the years but its core connotation remains unchanged. In fact, Bob Marley dedicated his work to proliferating peace, unity, and solidarity. In the 1980s, when the two major political parties engendered deep-seated rifts among Jamaicans, the musical icon, in an unprecedented peace initiative, hosted both political leaders and the Jamaican public in a peace keeping concert which prompted the significant handshake between JLP leader, Edward Seaga, and PNP’s Joshua, Michael Manley. In times when threats to his life were imminent, the un-phased Reggae warrior failed to graduate from his school of thought underscoring the role of politics and babylon in the island’s warring factions. Posthumously, Bob Marley remains a major contributor to the preservation of the Jamaican culture. His album, EXODUS, is dubbed Album of the Century by Time Magazine. Additionally, he left a legacy of offspring, legitimate or not, who immortalize his brief presence here with us. In some of the most nostalgic representations of their father’s work, Ziggy, Stephen, and Damian especially, continue to remind the world what it really means to be great.